I believe strong brands create communities. To protect your privacy, please do not post phone numbers, email addresses or private information in the body of your comment – you can send a Facebook message privately to me on this page. 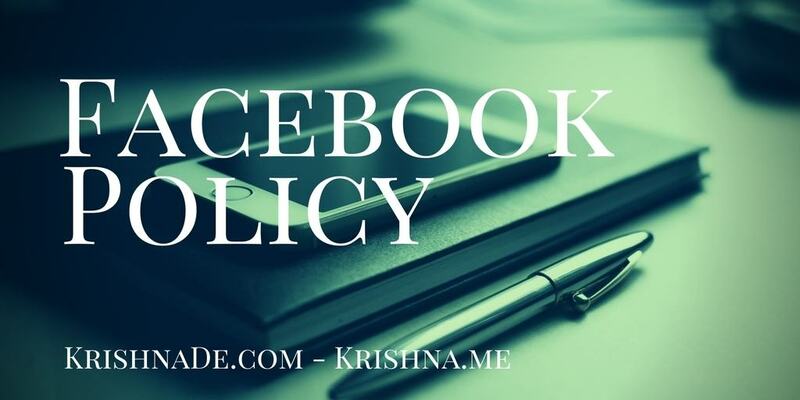 This Facebook Page is not a place to promote your services or products to readers – I reserve the right to edit or delete spam comments that include terms that may be offensive to others, or comments that explicitly promote a product or service or are clearly an affiliate link for the person posting. Posted comments and images do not necessarily represent the views of Krishna De. External links on this site do not constitute official endorsement. Krishna De does not agree with or endorse every comment that individuals post on our pages. Our goal is to share ideas and information with as many individuals as possible and our policy is to accept the majority of comments made. – Comments that are in languages other than English as this is the main language of the page. Please note that Facebook Comments on live video are not able to be moderated in real time, so comments will be reviewed after the live stream has finished and may be deleted at that time. For any content that you submit, you grant Krishna De a perpetual, irrevocable, royalty-free, transferable right and license to use, copy, modify, delete in its entirety, adapt, publish, translate, create derivative works from and/or sell and/or distribute such content and/or incorporate such content into any form, medium or technology throughout the world without compensation to you. Thank you for your support in making the discussions on this Facebook Page a productive and enjoyable experience for all who read it.